Capoeira began as a martial arts discipline in western Africa almost 400 years ago. During the slave trade, capoeira was transported over to the Americas, where it is now most commonly associated with Brazil and is a blend of martial arts and dance. To give your exercise routine an intense boost, include a capoeira workout one to two times a week. 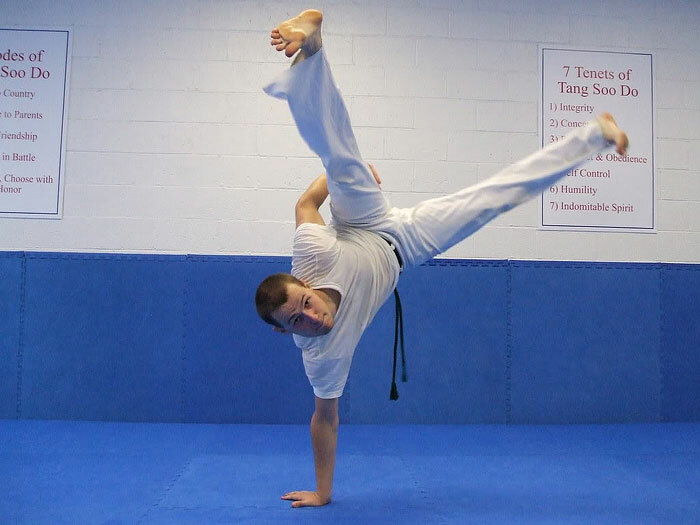 Capoeira workouts can be done through classes offered at a community center or your local gym. A high-energy, play-filled and musical workout, capoeira classes are the ideal way to learn capoeira because many of the moves are labor intensive and complex, and require professional instruction to master. 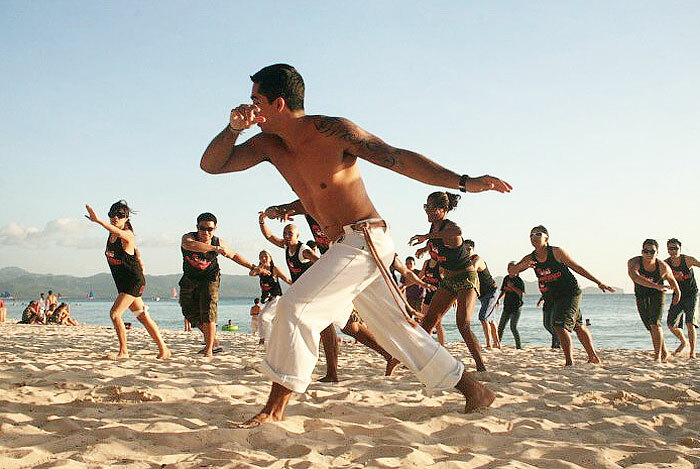 In a capoeira class workout, the instructor will start with teaching or reviewing basic moves of the capoeira. Instructors could start with a simple side-to-side step with alternating front kicks and punches for 5 to 10 minutes as a gentle warm-up. 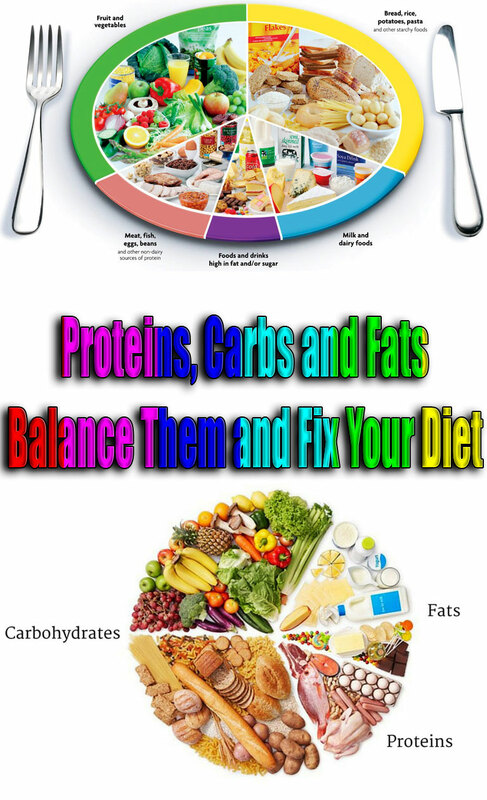 Continue the workout/class with a review of individual moves from basic to advanced levels, and close with the roda, or the “battle circle,” and a cool down period. Start with the ginga after a gentle side-to-side stepping, kicking and punching warm up for five minutes. The weight shifting, mix of fitness and dance steps and combined oppositional arm movements required for the ginga characterize much of capoeira. Taking a step back with your right foot, sink down on your left foot, bending at the knee and hip, going as low as you can. Allow your right leg to fully extend diagonally behind and to the side of your body. As you sink down, bend your right arm so that a 90-degree angle forms between your upper and lower arm and bring your right forearm up so it is in front of your face. Rise back up, bringing your feet together and lowering your right arm. Repeat the move on the opposite side, sinking down on your left leg. Do this 10 times for three sets, flowing between gingas on your right and left sides. 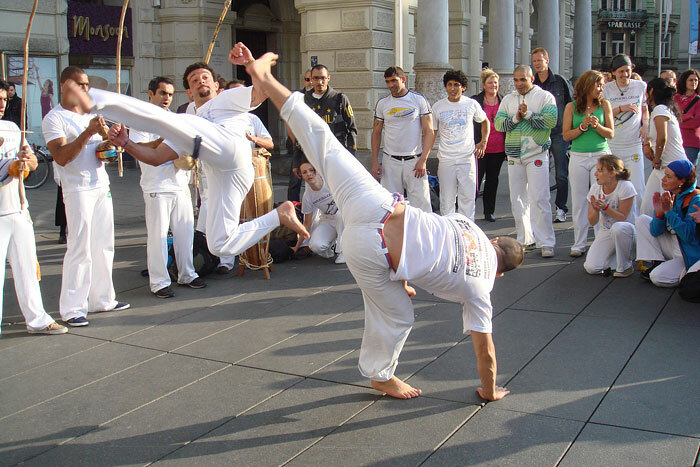 Continue on with the au normal, a medium-level capoeira move. The au normal is the same thing as a cartwheel and is used to circle around your opponent as an evasion technique. Done more slowly than the traditional cartwheel, the arms and legs are bent forwards to protect your face and torso from potential attack. Your face looks straight ahead rather than at the ground, as you want to be aware of your opponents position. To do the au normal, stand with your feet hip-width apart and your arms raised in a “V” shape around your head. Bending your body to the side, lower your upper body sideways so your right or left arm touches the ground first, using momentum to bring your body around in a circle, slowly moving your legs through the air. 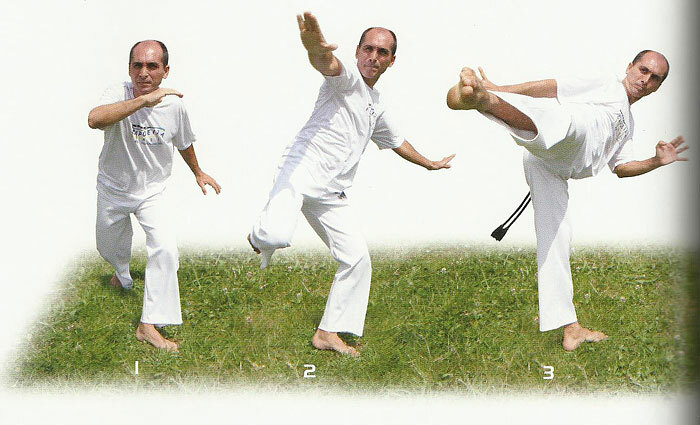 As the final exercise before the roda in your capoeira workout, do the martelo. The martelo shows off capoeira’s martial arts roots, as this move resembles the roundhouse kick. It builds strength in your core muscles as well as working and stretching your leg muscles. Standing with your feet hip-width apart, raise your right leg, bending at the knee, and kick it straight out towards the side, forming a 90-degree angle between your two legs. Your upper body should tilt slightly to the left to counterbalance your right leg. 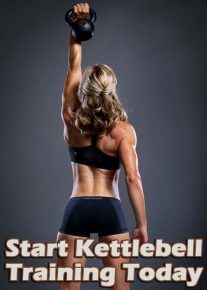 Repeat on your left side, doing three sets of 10 reps per side. As the final portion of your capoeira workout, do the roda, which is the performance circle in which capoeira “battles” are conducted. As all the class participants form a circle around the two competitors, the competitors face each other and circle around the roda, practicing their different moves — attacks and evasions — with each other. As the other class members cheer you on through calls, claps and music, you learn to combine and use your hard earned capoeira moves. Finish with a five to 10-minute cooldown session of gentle, slow walking and stretching for your entire body to loosen hardworking muscles.